Since my days as a Penn undergrad, I've always been a fan of Off the Beat and the talent the group gets from year to year. 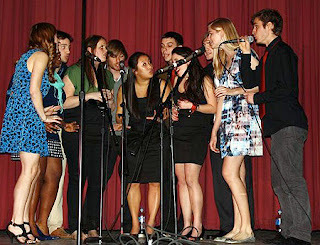 Recently the group came to LA during their spring break and put on a great show. After the jump, listen to some really powerful voices from both their LA performance and from a preview spring show video promoting their Spring show this weekend. This is the week where students across the country find out if they got into Penn. Check out THESE favorite videos from years past of kids filming themselves opening their letters! If you haven't seen these before, it's a must! Over the past year, we've seen lots of Penn alumni love for Lady Gaga. After the jump, check out the latest Gaga reinterpretation from the very theatrical Penn Band as they get their "Bad Romance" on. ...And when the rest of the band uses their body to move to the beat, be sure to notice how the drummer uses his head to get into it (my favorite!). Over the past few years, we've seen a whole bunch of Penn alumni appear on Bravo shows. Last year, I did a post about Jake Spitz (C'96) appearing on "Bethenny Getting Married". He's back again this season and tonight Bethenny is looking to set him up. Now, 18 months and 10 DT vlog episodes later, Ben Naecker (C'09, Water Polo) and Blake West (W'09, Jazz Combos) kept the faith and finally found someone "instrumental" to their progress in Austin. All the while, they've been preaching that "real jobs are not their forte", however after a year, Ben indeed applied to grad school. After the jump find out if he got in, what effect that may have on all the work they've done thus far ...and which Wharton professor (and record producer!) they'll be working with.